How does a person become one of the elect? Is it by a Divine choice of individuals or a human choice responding to a Divine invitation? Klein (chairman, NT department, Denver Seminary) sees two kinds of election in scripture. One is corporate wherein God elects a corporate body. 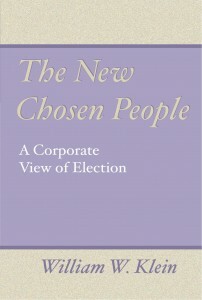 There have been two such corporate elections: Israel and the church. The other is individual for purposes of service, not for personal salvation. According to Klein, an individual becomes elect when he exercises personal faith. Because Christ was elect, we become elect when we enter Him by faith. He says, ‘‘Individuals find their election in being part of the elect body of Christ. The New Testament writers do not cite election as the underlying reason or cause why some individuals believe, or its lack as the explanation why others do not.’’ This is where many of us place scriptures such as Eph 1:4. The great value of this book is as a reference book. Klein has dealt with every New Testament verse which speaks of elective purposes in a chronological order so they can be easily accessed. For those of us who are not predestinarian in doctrine, this is a valuable tool.